I took this off a web site that I visited. I was sent there by a post that appeared on a list I am a member of. My friend and I have been working with a 4 year old Arab mare. She had been living on the range in Texas and had barely been handled. This is my horse; my friend wanted to take on the challenge of working with her. My friend has been studying Pat Parelli methods of training and Natural Horsemanship generally. We have been working with her in the round pen. Things seemed to be going really well- the mare was getting to the point where she seemed to have ponied up and was respecting our space and direction -for about a week. The problem we are having at the moment is that I think she is trying to push us to see how far she can go towards being the lead mare. There is no respect there for the humans who have been working with her. She has begun to stop on her own or stop when she is being asked to change directions, turn towards the center of the round pen and charge, with her ears flattened and striking with her front legs. As or if she goes by, she cow- kicks out with her hind legs on the way by. She tried to back me into the 'wall' of the round pen, and I have to admit I was very frightened (which I am sure she was aware of.) It is hard not to be when there is a horse striking out with its front legs less than a foot away from your precious skull. I did manage to back her up (we have been teaching her to back) after the third such 'attack' and, after that small concession (her backing up) I left the round pen. My friend proceeded to work with her, and was charged several times. Each time my friend was able to resist moving away from her and was able to back her off, but this is a dangerous and escalating situation. I am really afraid that somebody is going to be seriously hurt by this horse. What is going on here? What can we do? How can we avoid having somebody getting hurt? Help? In working horses in the round pen I often have horses "charge" me and cow kick at me as they go by. I really pay no attention to it other than to realize this is the "I'm going to see if he'll bluff into line," maneuver. Once they see that I'm not paying any attention they abandon the practice fairly quickly, as a rule. There are some who threaten me several times before they abandon it, but for the most part, it is nothing to worry about - just make sure you keep your distance, you don't want to let the horse close enough to you to catch you with a hoof as it goes by. BUT SOMETIMES YOU HAVE A HORSE LIKE THIS. Before we go on I have to say right up front, I am a restraint and force free trainer. I want to use the horse's actions and initiative to train as much as possible. But there are some things that will cause me to abandon my lofty calling for a moment or two. This kind of behavior is one of them. I don't often encounter a horse this determined but I do run into them from time to time. Biting is one thing that makes me forget my lofty calling. When the subject of biting comes up folks invariably quote the "official" clinician's mantra, "You have three seconds to make the horse think it is going to die and the head is off limits." I say you have until you have to take a breath to kill it and no part of the horse is off limits. Once you have to take a breath you have to stop. You have made your point. Biting is a blatantly aggressive action. If bitten, I retaliate immediately, using all the noise and force I can muster. I will do everything in my power to convince the horse he has committed a grave error and is on the verge of dying. Once its actions and body language tell me, "Hey man, it was just a joke, my apologies," I forget it and it's business as usual again. Another thing that would make me forget my lofty calling would be serious charging along the lines of what is described in this post. As I said, a significant number of horses threaten me while going through the bonder but the threats are half hearted and uncertain, more testing than anything. ("I've got nothing to lose, I'll show him my heels without getting too close in case it doesn't work and see what happens.") They make these threats without getting within range of me. Then there are those horses who are serious and perfectly willing to close in and duke it out. If you are unlucky enough to get into the middle of one of these confrontations, you *WILL* lose. Flight is a fear response. An attack is an aggressive response. Determined aggression in horses is so serious it must not be tolerated. Being attacked by a horse is beyond your worse nightmare. Unless this horse can be dealt with quickly, at the very least this horse is destined for the killers, at the most it will kill. It is in the horse's best interest to stop this. In fact, it is crucial to its well being. If anything happens to the owner the horse will likely end up down the road where its situation may be a whole lot worse. I define this type of horse as a determined challenger. Its mind is made up and it has no doubt that it will close in and mix it up. I can count on one hand the number of determined challengers I have come across and with the exception of one I've managed to defeat their challenges. My one "failure" was a very large 2000+lb draft whose owner didn't see there was a problem and I decided not to push the issue because I didn't want her going around saying, "He beat my baby up for no reason!" They circle led him every where and never demanded he do anything he didn't want to do. Let's transfer this to a herd dynamics situation. For example, in the herd one horse attacks another. The attacked horse leaves, gets injured, or fights back with serious, bone-jarring, potentially lethal kicks. The horse that is mentally and/or physically over powered undergoes psychological changes that affect its herd dynamics. It has had its position in the pecking order reaffirmed, in regards to the victorious horse anyway. These attacks or challenges are met with physical retaliation. If the attacker's attack is rebuffed in some manner, it must honor the winning horse's right to do whatever it wants. In my herd, *I* have to be the victorious horse. It is in the best interest for both me and the horse. I then have to do the things that the lead horse has to do to not only become the lead horse, but to keep that position. People are continually telling me you cannot "become" a horse and I tell them they are right, but you can THINK and ACT like a horse. The horse does not respond to the human, it responds to the horse-like actions. The key to resolving this problem lies in meeting the challenge head on and defeating it. If this were to occur in a horse to horse situation between two horses equally determined to win they would just meet head to head and slug it out. But if we as humans meet a horse head to head and just slug it out we are going to regret it. It will likely mess up our day. Since the horse is used to addressing these situations head to head we have to change our approach. One way to do this is to go at the horse from the side and drive it away by any means possible. If the horse makes for us we want to get around to its side and "attack" it from there. In order to meet the attack the horse has to come about to face us. In order to do that, it almost always moves forward or away. 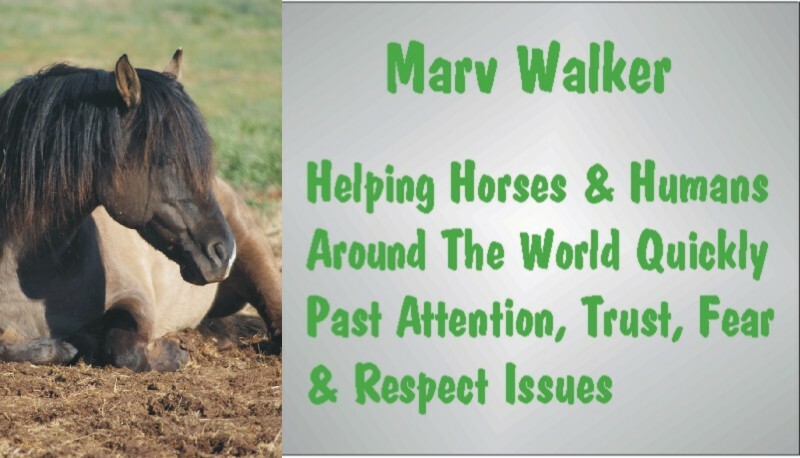 As long as you can keep the horse moving away you will be defeating the challenge in a manner that is consistent with horse behavior. If it aggressively approaches, you go to the side and drive at it with whatever means you have with all the energy you can muster. If it faces and approaches again, you go to the side and drive at it with whatever means you have with all the energy you can muster. And you keep doing that until the horse stops the aggression. Dealing with ultra aggressive horses requires determination. While SO FAR I have been able to stop aggression using this technique it is very dangerous and it is up to you to decide whether or not you wish to deal with these horses. Anything can go wrong. But, if the horse aggressively moves on you, and you stand there or you run, it is equally dangerous. You have to do something. *I* choose to take the battle to the horse with as much energy and noise as I can muster. Some time ago I heard of a horse I was assured "would eat your lunch" (direct quote). When it looked for a while like I was going to be called in I made up my mind what I would do. It may cause some ruffled feathers and cries of indignation but the alternative would be worse. I would go to the nearest self defense supplier that handled extremely serious stun guns and I would buy one. I'd tightly tape it to the end of a stout 8 foot dowel and move the switch down to my end. I'd get the horse into the round pen and then get in with it. I would give the horse the opportunity to leave. As I said earlier, if I can keep it moving away I can get past the aggression. If it seriously turned on me I would use the stick to touch the stun gun to it. Hopefully, it would collapse like a brick silo and when its nervous system recovered, it would get up and we'd forget it ever happened. Unless it did it again. I would apply the stun every time it attacked me until it quit doing it. Each time it got up, I'd act like nothing happened and we'd go on from there. And you know what? Horses are pretty sharp. It wouldn't hold the stun gunning against me even if it connected me with the results. Animals have a very heightened sense of justice. They know instinctively that certain actions cause certain reactions. (By the same token frivolous application of the stun gun, and any other unjust action, would offend the animal's sense of justice.) We as humans start justifying degrees and motives and then justice becomes murky. In animals, justice is cut and dried and accepted. It would quickly learn to stay away from me. At that point I can begin to help the horse to accept my directions and help it develop a better sense of security and trust and hopefully eliminate the need to put humans in their place.. I am not recommending anyone do what I have outlined. I am merely saying *I would* do it in a split second. Some problems require drastic measures and aggression is one of them. At the very least resolving the situation is in the horse's best interest. If you are injured, who is going to care for the horse? If the situation is not resolved the horse may very well end up passed from place to place on its way to the killers. Placing your self in with an aggressive animal is an extremely risky action. Especially one the size and speed of a horse. In my own mind, I feel that I have the confidence, knowledge and ability to do what I have outlined. Whatever you decide to do with an animal who is seriously aggressive, you better be certain you know what you are doing and have a plan that you are capable of implementing. It goes without saying, WEAR A HELMET, SAFETY VEST and take every other precaution you have ever heard of.